Zahira Kelly, an African-Latina writer, artist, international speaker and award-winning sociocultural critic, will serve as the keynote speaker for Noche de Gala, which will be held at 7 p.m. Sept. 27 at Stephen F. Austin State University. Tickets are available at the information desk on the first floor of the Baker Pattillo Student Center and online at sfasu.edu/oma. NACOGDOCHES, Texas - Stephen F. Austin State University's Office of Multicultural Affairs is hosting Noche de Gala to celebrate Hispanic-Latinx Heritage Month at 7 p.m. Sept. 27 in the Twilight Ballroom in the Baker Pattillo Student Center on the SFA campus. Keynote speaker Zahira Kelly, an African-Latina writer, artist, international speaker and award-winning sociocultural critic, will discuss her experiences as an African-Latinx woman and address current issues within the Latinx community. "Representation is really important when it comes to communities of color. The ability to see somebody who looks like you doing something you've always aspired to do can be a very impactful moment," said Andrea Flores, SFA student ambassador for OMA. "That is why we invited Zahira Kelly to present at Noche de Gala, so she could bring awareness to African-Latinx culture, which is often underrepresented in many areas." An advocate for African-Latina visibility and rights on social media, Kelly is known for her unfiltered social critique. She co-hosted the Afro-Latino Fest 2017 Concert and is a TEDx Mexico City Women speaker. She has participated in speaking engagements, panels and lectures at events in the U.S., Europe and Canada. 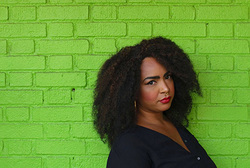 Kelly writes a candid advice column at TheNewInquiry.com and is creator and author of Bad-Dominicana, an African-Latina feminist blog. She also has a large and growing following on Twitter. She has received several awards, including the Advocacy and Leadership Award at Afro-Latino Fest 2017 and an #AfrolatinasWhoRock award for being an African-Latina revolutionizing the world around her in October 2015. Kelly's visual art, which is dedicated to highlighting African-Latina and women of color's beauty, has been exhibited at the Institute of Contemporary Art in Boston, among other galleries and in publications. She uses many mediums, including watercolor, photography, pencil illustration, oils, acrylics, animation and digital. Her art materializes women often rendered invisible by an era and society that prized middle-to-upper class white womanhood and beauty as a paragon of femininity. Noche de Gala attendees will have the opportunity to enjoy Latinx-infused music and performances that showcase the beauty and diversity of the Hispanic-Latinx culture. Tickets are available at the information desk on the first floor of the student center and online at sfasu.edu/oma. Admission is $3 for students, and $5 for faculty, staff and community members. Dinner will be provided with admission. Attendees should dress to impress. For more information, contact OMA at (936) 468-1073.